Which will warm your blood quicker? 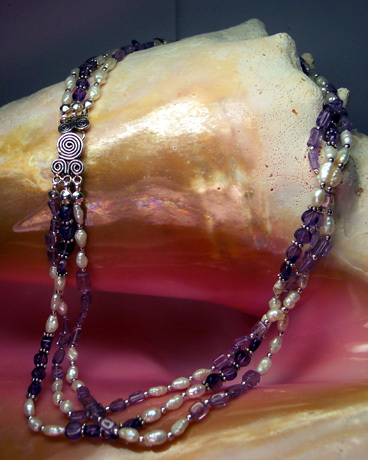 The luscious purple African Amethyst or the warm Freshwater Pearls with their radiant luster? 6-8 mm Amethyst cubes, 3-4 mm Amethyst coins, 4.5-5 mm Freshwater rice pearls, 2 mm seamless Sterling Silver round beads, 4x1 mm Bali spacers, strung on silk thread and finished off with a Sterling Silver three strand Hook and Eye clasp with a Swirl design.